Bali Shabali Surfing School offers the attractive program that really good support more than usual private course, and lessons are taught by a Japanese instructor. This is the good school for who want to learn surfing seriously and building up skills! They arrange the program to be suitable for each student, so you can take the lesson for your level. Shabali Surfing School offers the attractive program that really good support more than usual private course, and lessons are taught by a Japanese instructor. 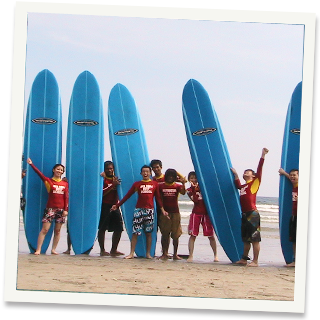 If you are really serious about learning surfing, it is the course for you. They decide the program depend on the individual level. Serious surfing lesson! Learn hard! Great support, 2 assistants for 1 student! Surf experience over 30 years, Japanese instructor teach you! The point is near from beach! 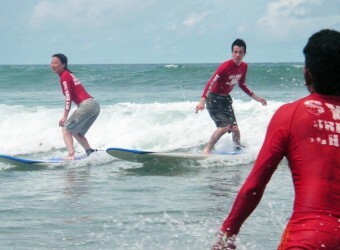 Syabali Surfing School courses are Regular Lesson and Japanese instructor Special Lesson. For both courses, Japanese instructor gives you lesson, but for resular lesson, 1 instructor for several students, and for special lesson, 1 instructor for 1 student. For regular and special lesson, 2 Indonesian assistants for 1 student beside a Japanese instructor, and support lesson in the ocean. 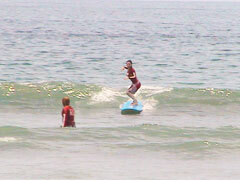 * Indonesian assistants are well trained surf instructor as other company says. - Experience Surfing is regular lesson only. - Lesson program is changed depand on level. Lesson can be start in every 30min during 8:00 - 15:00. You can request your favorite starting time. Please let us know starting time when you book. I don't join surfing school, but is it possible to go with my friends? Yes, you can. We don't require extra charge, etc. Can I go shopping in Kuta before going back to hotel? Yes, you can. If you have request, please let us know when you book. * The maximum 7 people can be fit in one car. * Drop-off to your requested place other than hotel is available. Insurance is not included. Please apply to an international travel insurance before you book. Guest without insurance cannot take our lessons. I can`t swim and a wimp, but I could stand on the surfboard. I tried to do the best. It was like a private lesson, and the Japanese instructor conducted the lesson. I think that if I trained hard on the land I can also do well in the water. I learned the basic surfing on the land then went to the beach. I was happy the lesson conducted by a Japanese instructor. He gave me advice and tips to be able to surf well. I really wanted to be able to stand on the surfboard and now I can do that, I`ll go to the next step.